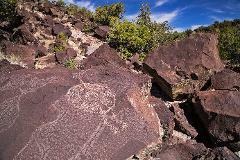 Purchase a private tour of the Wells Petroglyph Preserve for yourself, family and friends. Dates and tour routes are flexible, and you have a guide all to yourselves! $200 for the first 1-4 participants and $50 per person after that. This tour option is available for third party organizations seeking to visit the Wells Petroglyph Preserve. 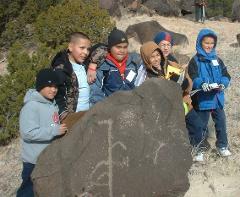 The Project invites educational organizations within New Mexico to visit the Wells Petroglyph Preserve free of charge. Elementary through high school groups are welcome (ages 10 and above). We invite Native American visitors to tour the Wells Petroglyph Preserve on a docent-led tour free of charge. If interested please "purchase" the quantity of visitors in your group.